It would, certainly, have been a great privilege for Waidyatilleka to work with internationally reputed Sri Lankan Engineers in the calibre of Dr. A.N.S Kulasinha. As the years roll on, he not only excelled in the field of Engineering gathering knowledge and experience but also takes leaps and bounds strides in the field of Sports serving in national and international sports bodies. He was a senior vice president of the Athletic Association of Sri Lanka. Waidyatilleka holds many positions in the field of sports including the President of the Sri Lanka Masters Athletics (Veterans), President Athletic Technical Officials Association of Sri Lanka, Member Technical Committee Asian Athletic Association, Chairman Technical Committee Asian Masters Athletics, Member of Stadia Committee World Masters Athletics and International Technical Officer of World Masters Athletics. Walking along memory lane, Waidyatilaka recollected that he was born and bred in the Southern province and he shares remarkable traits of being a cosmopolitan albeit deeply rooted in his soil of birth. He hails from a land mass which gave birth to a host of personalities who were not only recognised for their outstanding contribution to the nation but also as trend setters in their respective spheres of activities. Inspired by Dr. A.N.S Kulasinha, Sir Cyril de Zoyza, Sir Lalitha Rajapaksa, Dr. Colvin R de Silva, Dr. E. M. Wijerama, Ven. Megettuwatte Gunananda, Prof. Kosgoda Dammawasa, he recalls with humility the days that he contributed to the construction of the Kalutara Chaithya, under the guidance of Dr.A.N.S Kulasinha. He grew up in a family of landed gentry, his father being a respected Principal, Amaradasa Waidyatilaka and mother Ms. Allen Perera, as the only son of the family. Being a family who firmly believed in Buddhist ethos coupled with a discipline-oriented educational background, Waidyatilaka was naturally the most cared for child in a family surrounded by sisters. 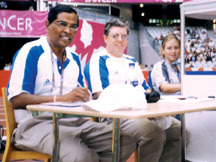 Officiating as the International Technical Official at the World Championship in Paris in 2003. Asian Masters’ Athletics Technical Committee Chairman. Following his primary education at Revatha Vidyalaya, Waidyatilaka was admitted to Richmond College Galle as a hosteller not only providing him with ample time to excel in studies but also to develop an impressive sporting career. 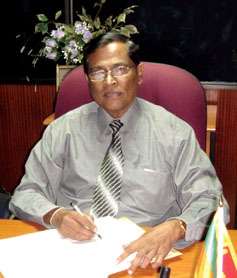 During his school days which he spent together with his contemporaries including President Mahinda Rajapaksa, Minister of Justice Amarasiri Dodangoda and Minister of Agricultural Development Chamal Rajapaksa, Waidyatilleka won the 120 yards hurdles as well as the high jump and the 440 yards run. He captained Richmond College and won Junior and Senior Hurdles at the Public Schools championships. His love for sports did not detract him from his studies. He was one of the brightest students at the time and carried away the coveted Pure Mathematics and Applied Mathematics prizes at the University Entrance class. On completion of his secondary education at Richmond College, Waidyatilleka was admitted to Nalanda College on the advice of his Principal father. Sponsoring a poor athlete under the Foster Parent scheme. 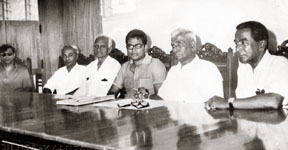 Former Minister of Trade Lalith Athulathmudali is also in the picture. Chairing a press conference in Bangkok 2004 at the Asian Masters Athletic Championship. He entered the University of Ceylon (Peradeniya) as one of the two students who qualified to enter the Faculty of Engineering from Nalanda College in that particular year. As Peradeniya was an exclusively residential university against the salubrious climate in the hill country, Waidyatilleka was admitted to the famous "Akbar Hall". Apart from his academic records, one of his major achievements was the championship in the 110 metre and 400 metre hurdles which he won consecutively in all four years that he spent at the University, thus becoming the best athlete during his time. Whilst at the university, he had the privilege of engaging in the noble profession of teaching to impart the knowledge he gained through his academic programme to deserving students in schools with less amenities and human resources. Though he earned his Bachelor of Science (Engineering) Degree, he opted to stay another year at the university as an instructor prompted by his dedication, perseverance and academic excellence. Waidyatilleka started his career as an Engineer at the State Engineering Corporation in 1967 and he married a Visakhian Sportswoman Miss Visakha Gunaratna who was adjudged the Runner-up Sports Queen at the Sports Queen Contest conducted by the Daily News. Waidyatilleka has two sisters; Malini and Padmini and they are teachers by profession. His son Indu Waidyatilaka is a doctor while his daughter Mihiri who is a Computer professional is now domiciled in the U.S.
After his marriage, Waidyatilaka flew to United Kingdom to read for his master's degree in Engineering and obtained his Msc. (Eng) from the University of Birmingham. In 1970 he obtained the charter from the Institution of Civil Engineers London and later earned the Fellowship from The Institute of Engineers Sri Lanka. In retrospect of his longstanding career as an Engineer, he evoked vivid memories of his involvement under the leadership of the then Chairman of the State Engineering Corporation, the legendary Dr. A.N.S. Kulasinghe in the construction of Watadageya (outer layer of the Chaithiya) of the Kalutara Chaithya. It is still a little known fact that this onerous task was entrusted with young Engineer Waidyatilleka who completed the work well before the scheduled time. He was directly involved either in the design or in construction of many successful projects undertaken by the State Engineering Corporation, including the Head Quarters of People's Bank, Lotteries Board building, Labour Secretariat Building as well as mega housing schemes such as Raddoluwa and Mattegoda housing schemes. He also planned and constructed the Mirissa and Tangalle fisheries harbours and the Paddy Stores in Polonnaruwa. Following his retirement from State Engineering Corporation, Waidyatilaka who was a founding Director of Kelani Paper Converters was appointed Managing Director and became a successful entrepreneur. Redolent on one of the defining moments in his sporting career that tested his character and integrity was when he made a ruling as IAAF International Technical Official at the world Athletics Championship 2003 in Paris. Jamaican Thomas Dwight got off to a false start in the men's 100 metres. At the second attempt, the athletes were recalled for another false start as Jon Drummond of America and Jamaican Asafa Powell were caught inside one tenth of a second. At this point, Drummond showed his discontent and refused to leave the field. Waidyatilaka however stood by his decision. When the French Officials failed to convince Drummond, Waidyatilaka had to intervene and explain the rules and persuade him to leave the track. He thus de-fused an otherwise explosive situation. He was later commended by the IAAF hierarchy for his judgment and unwavering steadfastness. It's his hard work and dedication which brought him to the top as an International Technical Official and International Lecturer. He passed the IAAF Level 1 Lecturers examination with flying colours and was an automatic choice for the Asian Technical Officials (ATO) examination. Waidyatilaka scored 100 per cent marks at the ATO written examination in 1997 a record which can never be surpassed. At the International Technical Officials Examination held in 2001 Waidyatilaka topped the pass list for Asia and was appointed as ITO for the period 2002-2005. Again in 2005 he did Sri Lanka proud by topping the Asian list and was appointed ITO for the period 2006-2009. Waidyatilaka is also engaged in community work. He is the President of the YMBA-Balapitiya, Member of the Crippled Children's Aid Association, Vice President of Suhadha Sahajeewana Sanwardhana Sanwidanaya an association formed to help needy children. Waidyatilaka inaugurated a scholarship fund in memory of his late father and now the association is awarding nearly 40 scholarships annually to the scholars. Waidyatilaka is one of the Chief Dayakas at the Gangarama Temple in Pamankada and contributes to uplift the standard of the Temple. He has helped needy families by constructing homes for them with his own funds. Currently, he is constructing an "Avasa" for Buddhist Monks in the Panagoda area. Commenting on the debacle at the just concluded Asian Games in Doha, Qatar Waidyatilaka says it was a folly to have sent such a large team of Sportsmen & women from Sri Lanka. The only sport we can clearly say that Sri Lanka has reached Asian standard is athletics. Weight Lifting and Boxing too can be considered Asian standard. I won't blame the N.O.C. (National Olympic Committee) for sending a large team. It is the responsibility of the respective National Associations to select the proper teams. There was a sense of euphoria in the country when Sri Lanka fared well at the South Asian Games in August this year and won a large number of medals. Without belittling the achievement by our sportsmen & women we have to be realistic and accept that the standard of competition at the SAG is way below that of Asian Games in most sports. Maybe the National Associations felt they should reward the athletes who performed well at the SAG by giving them an opportunity to participate at the Asian Games. Maybe they felt the experience gained by them will stand in good stead in the future. Experience is good for those who are close to Asian standards. For the rest, in his opinion, it did more harm than good by exposing them to such high level of competition. Initially, we should concentrate on regional level competitions before throwing them at the deep end. "For example, we can have swimming competitions with States in India such as Tamil Nadu and Karnataka. Also with Singapore, Thailand and Malaysia, our close neighbours. This way the athletes will benefit much more than competing in a level way beyond them" says Waidyatillaka. Also National Associations should plan for the future. We must have a second string of athletes to take over from the seniors who will retire within a few years. Talent scouting should be done at school level as the school system is the cradle of all sports. Once the athletes are selected they should be carefully nurtured, trained and properly looked after. This is how the former minister of sports S.B. 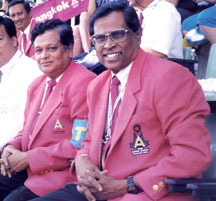 Dissanayake raised the level of sports in Sri Lanka culminating in achieving a medal at the 2000 Sydney Olympics. Another milestone in his sporting career was Waidyatilleka's appointment as an International Technical Officer (ITO) by IAAF, being the first Sri Lankan to hold the position. He is also credited with being the only Sri Lankan Athletic Technical Officer to officiate at a Commonwealth Games when he was invited to officiate at the xvi Games in Kuala Lumpur in 1998. He was appointed as an International Technical Officer by the IAAF to the panel of International Technical Officials for the period 2006-2009. He is also the only Sri Lankan to qualify as an IAAF Lecturer and as an International Technical Officer. 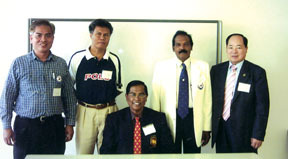 The president of the North East Athletics Confederation, T. M. Devendran, with much gratitude jogged his memory that Waidyatillaka, as the Chairman of the Technical Committee of the Athletic Association of Sri Lanka introduced Tamil Language for the Technical Examinations in Sri Lanka in 1997 and he arranged examination centres in Jaffna and Vavunia at a very difficult period. 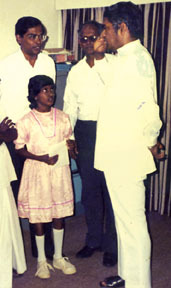 He had also visited Jaffna and conducted several number of seminars in the North.